It's hard to believe that VeggieTales has been around since 1993. I was in high school in 1993! Now here we are 20+ years later and my kids watch and love Veggie Tales. All nostalgia aside, VeggieTales is really a great show. I'd call it one of the best animated shows for teaching Bible stories, character, and morality. 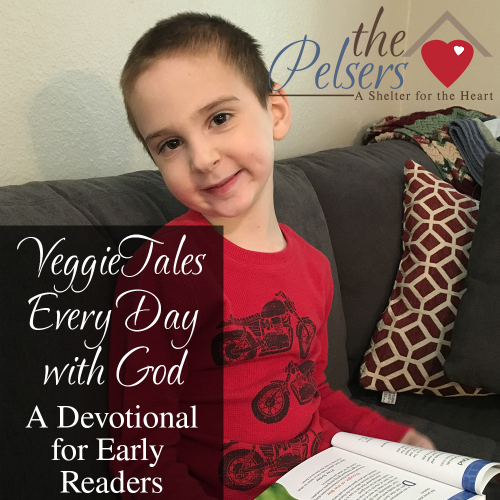 So, I was really excited when I was asked to take a look at and share a VeggieTales devotional for little boys with you! VeggieTales Every Day with God, as the title implies, has 365 short daily reading for your kids. Each reading has a title, focus verse, a short devotional reading, a closing thought of the day to summarize the reading, and a prayer. My 5 year old is currently reading at a solid 2nd grade level or higher and has no trouble picking up this devotional and reading the entire page on his own. It would be good for your early readers, but younger kids or later readers can still benefit from having the daily devotional read to them. Physically, the book just the right size for my 5 year old to hold in his hands and the pages fairly thick and glossy. It has a good “feel” to it for a child and seems durable. Let my clarify some of my personal opinions on Bible study and devotional materials for kids: I'm not a fan of a lot of color, fanfare, or gimmicks when it comes to teaching the Bible to kids. I think most kids, even toddlers, are smarter and more in tune with God than adults often give them credit for. I like VeggieTales Every Day with God because while the branding is there and appealing to my 5 year old, it's not overwhelming. The characters and color add just enough to the pages without being distracting. My 5 year old says that he likes the stories, but his favorite part of the daily reading is the prayer. He likes to pray on his own, but he likes that the scripted prayer helps him to pray specifically about what he learned that day. Daily devotionals are great, but they are no good if you don't pick them up and read them, right? Initially, my 5 year old took the book to his bed and was reading it there at night. After a few days of that, we felt it was better to have the book out where he'd see it and read it in the mornings. Our copy of of VeggieTales Every Day with God now lives on the side table in our living room, right next to my Bible, journal, and my other other currently in process books. Right after breakfast, he grabs his devotional off the table to read the page for the day before he and I pick up with where we left off reading in his Bible. That's how we start his day. Then, it's on to homeschooling. I would love the boys version. My kids would love this devotional! I’d love the girl’s version of the Veggie Tales Devotional! I would choose the boy’s version for my son. This is wonderful. I would choose the devos for boys. I would pick Devos for girls because I do have a girl who is doing a lot of prereading stuff and wants to be able to read the Bible for herself so badly. I think this would be an encouragement for her. I have a girl & a boy, so either would be welcome! Thank you! This is great !!!! I have a boy and a girl, so is need both!! Lol. I love Veggie Tales! I was so glad it was on Netflix when we were staying with my in-laws so I could share it with my son. I would probably get a boy one first, and when my daughter is a bit older get the girly one. I would choose the girls version – three girls would get to enjoy this wonderful book! So glad to see something like this! I would love a copy of the girls devotional…my three girls LOVE VeggieTales! I would choose the girl’s version! Either, I have a boy and a girl early readers that I homeschool, These would be great! Our littlest guy loves VT too and they could read to him. I would like a copy of the Devils for girls! Thank you for this wonderful offer! Love Veggie Tales and What’s In The BIBLE? Would love a free copy for my preschoolers. I would love to get a copy for my son. although he is a bit older ok he’s a lot older he had brain damage when he was a baby when he ran a 106 degree fever. It took people all over the world praying for him before he turned the corner and lived but it caused a lot of brain damage. That would be something he would love to have. The girls version for my daughter. I have 3 boys! So the Boy version for us. I would love to share this devotional with my dyslexic daughter. Thanks for the great review , I would love the girls one for my daughter . We would love the girls devotional. I have 2 girls that love veggie tales and Jesus! I would choose the boys version! I would actually love both but my daughter is older and would get the most use out of it right now. I would choose the one for boys. My first thought was the boy version because my son is older. Then I realized, duh, I have a daughter, too. Since she’s two is probably still pick the boy’s version just to check it out and see if I really like it.